Although human development throughout the lifecycle is an unbroken sequence of change, it is helpful to subdivide it into phases to help us with description and study and so we can appreciate key events and qualities at each stage. Development before birth is usefully divided into 3 periods: preimplantation, embryonic, and fetal periods. This lasts from conception (fertilisation) to implantation of the conceptus in the mother’s uterine endometrium. It lasts for approximately 7 days. It is characterised by a free-floating existence and the preimplantation conceptus is relatively resistant to external influences. 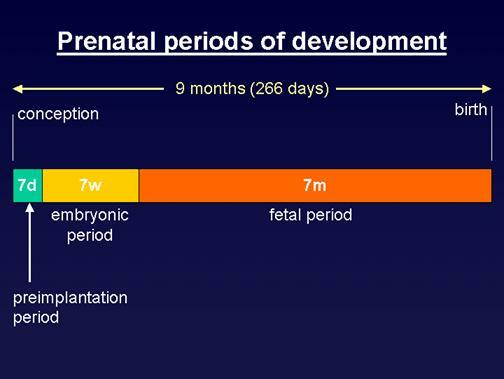 The embryonic period extends from implantation to the end of the second month, a period of 7 weeks. During this period, all the different parts of the body are established - in miniature. Development during this period is rapid and intricate, and the embryo is extremely sensitive to harmful factors - this is a time when major developmental errors can occur. From the beginning f the third month until birth, the developing baby is called a fetus. It grows rapidly in size and mass, and the organs and systems of the body mature and rehearse their functions in preparation for birth. The fetal period lasts for 7 months. The fetus is less sensitive than the embryo, but it can be adversely affected by harmful factors.